Recognised Community Groups, such as Youth Clubs, Sports Clubs, Church Groups, Organisations for the Disabled; also more informal groups or individuals needing transport to places of Worship, Community Activities, Cultural and/or Educational Events. Our drivers are all volunteers. They are not paid and do not expect, or accept ‘tips’. We cannot guarantee that the bus, or a driver, will always be available. We will, however, do our best to help out wherever we can. It is a particular requirement that any groups of children, or other groups considered ‘vulnerable’ will be accompanied by a responsible person who, if necessary, will take adequate steps to ensure the proper and safe conduct of all traveling on the bus. The driver cannot undertake this function. The more notice you can give us of a booking, the more likely it is that we will be able to help. All subject to a minimum charge of £15. = under £3.50 or so per head, if bus full. Note: there must also be at least one accompanying adult. If the originally planned for distance varies, for example due to a road closure, or to additional pick-ups or drop-offs having to be made, the final cost may be slightly more than originally quoted for. It might, of course, be slightly less. Those booking should, therefore, be prepared for the final amount charged varying. If your trip involves you being taken somewhere, being left there for much of the day, and being collected later, the bus and driver may need to return to base and come back for you: this is known as a ‘Double Journey’ and the time and mileage are chargeable. You will be advised of the likelihood of this when booking. We charge by time and by distance: it is the responsibility of the group leader making the booking to ensure that the whole charge can be met, and to divide up who pays what accordingly. It is particularly important to bear this in mind in the event of ‘no shows’, as the overall hire charge cannot be abated. The Driver will, as mentioned, be a volunteer. If, your trip is long, and extends over mealtimes, there is an expectation that the driver would be included in any meal arrangements you might be making or, at the very least, that you would give him/her the opportunity to purchase, and eat, a meal, and that you would contribute something towards this. At the time of writing, PVG Certification is not available to us as an organization (though many of our individual drivers have it ), so we cannot undertake to provide PVG certified personnel. It is, therefore, a particular requirement that any groups of children, or other groups considered ‘vulnerable’ will be accompanied by a responsible person who, if necessary, has the relevant certification in terms of Protection of Vulnerable Groups legislation and who will be able to meet the needs of any such vulnerable passengers, such as moving and handling including, where necessary, assuming responsibility for the proper and safe conduct of passengers. The Driver’s primary responsibility is to the vehicle and his/her ability to concentrate on driving conditions must not be compromised. The driver has complete discretion to discontinue any journey, should he/she feel that it cannot be completed safely, whether because of road conditions, the condition of the vehicle, or the health or conduct of anyone in the vehicle. The foregoing are considered material conditions upon our acceptance of any booking. Please contact us at thornhillcommunitytransport@yahoo.co.uk or on (01848) 330067 for clarification of any of these points. Who Can Book the Bus? Recognised Community Groups, such as Youth Clubs, Sports Clubs, Church Groups, Organisations for the Disabled; also more informal groups or individuals needing transport to places of Worship, Community Activities, Cultural and/or Educational Events. How Many Can You Take? The bus seats 15 people (plus the driver). It can accommodate up to 3 wheel-chairs, but, depending on the size, this can involve the removal of up to three ordinary seats per wheelchair. We will do our best to accommodate child seats/boosters where appropriate, but do not provide them. Can I book the bus and drive it myself? No. We under-take to provide a trained driver. This ensures your safety, protects the condition of the vehicle and is a requirement of our remit. Who pays your drivers? Our drivers, Committee and Office Bearers are all volunteers. They are not paid and do not expect, or accept, ‘tips’. What you pay goes directly towards the running costs of the vehicle and our (very small) operating costs, as do any donations kindly put in our various collecting tins in the local area. My family and I want to go to a wedding in Edinburgh . Can you help? Unless one or more of you specifically needs an accessible vehicle to travel in, this is not really in accordance with our remit. 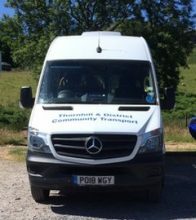 Our drivers are volun-teers and the Government and various parts of the Community have provided the vehicle to be used mainly for work of benefit to the Community. There may be occasions when we are able to help but, for the most part, we must respectfully direct such enquiries to local commercial operators. Can I book the bus to help me move a fridge-freezer? Sorry—it’s a passenger-carrying vehicle only. We’ll call you back to confirm availability and provide you with a quote.